Early vigour in wheat (Triticum aestivum) is an important physiological trait to improve water-use efficiency and grain yield, especially on light soils in Mediterranean-type climates. Potential interactions for plant stand and seedling vigour between seed density and various seed quality treatments were examined for wheat grown in two experiments, conducted under controlled and field environments inWestern Australia. Seed lotswere graded into seed size classes and seed density fractions using saturated solutions of ammonium sulphate or sodium polytungstate. 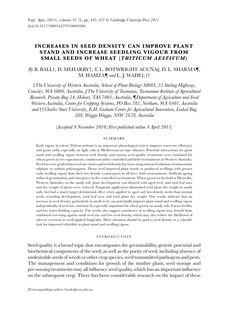 Dense seed improved plant stands or produced seedlings with greater early seedling vigour than their low-density counterparts in all three field environments. Artificial ageing reduced germination and emergence in the controlled environment.When grown in the field atMerredin,Western Australia, on the sandy soil, plant development was delayed with aged seed, and total leaf area and dry weight of plants were reduced. Fungicide application diminished total plant dry weight in sandy soils, but had a much larger detrimental effect when applied to aged and low-density seeds than normal seeds, retarding development, total leaf area and total plant dry weight. Our results indicate that an increase in seed density, particularly in small seed, can potentially improve plant stand and seedling vigour independently of seed size, and may be especially important for wheat grown on sandy soils of poor fertility and low water-holding capacity. The results also suggest consistency in seedling vigour may benefit from combined screening against small seed size and low seed density, which may also reduce the likelihood of adverse reactions to seed-applied fungicides. More attention should be paid to seed density as a valuable trait for improved reliability in plant stand and seedling vigour.